I just got cable recently for the first time in 8 years, so I’m still in the process of oogling over the station selection like I was seeing a flying car. Maddie and I came across this movie on the Lifetime Movie Network; yes, that is correct, it is a Lifetime movie and I watched it. Why, you ask? Well, it is a biopic of one of my favorite authors of all-time, JK Rowling. If I have to fill you in on her claim to fame, then you probably have been oblivious to pop culture for longer than I went without cable. Story-wise, as you can imagine, it follows the natural flow of a biopic. The first scene takes place in a limo after she has become famous. She is talking with her husband about her nerves and how surreal it all is before the premiere of the first Harry Potter movie. From there, we move into her child and go through the events of her life from about age 9 through the publication of the first book. Throughout, there are flourishes of details in which she got ideas that were subsequently incorporated into the book series. For instance, the character of Ron seems to be based partially on a good friend from her high school days. Following college, there is a decent amount of focus on her time as a teacher in Portugal, her first marriage, which ultimately ended in disaster, and her time as a struggling single mother in Edinburgh. Following the progression of her famous cafe writings, the film closes with a bookend where it began – at the premiere of the first film. The story flows like a stereotypical biopic and it is really fun to see the fairy tale-like rise to fame and fortune on the screen. Technically, it’s also a really polished movie for a made-for-tv film. I’m not certain what camera was used for this production, but judging by look, I would say the RED One. It seemed to have that RED-like warmth to the image. It’s a wonder what cameras like the RED One and Alexa are doing for these lower-budget television movies. It allows them to have all the polish and finesse, visually, of a major motion picture, and I think that is a wonderful thing for producers and audiences alike. All three actresses who played Jo Rowling over the course of the film did a great job. However, I was most impressed with Poppy Montgomery (who played Jo from around age 25 on in the film). She really sold the part 110%, not just in looks, but she really picked up on a lot of the mannerisms you see from Rowling in interviews and the like. In short, if you really love Harry Potter like I do, then you will likely enjoy this made-for-tv biopic. If, however, you are not big into the series, I doubt you will find much here. Her life definitely has some interesting parts, but not necessarily enough to keep a non-fan viewer fully engaged. One word can easily describe this movie: bizarre. But, if you look at the front of the DVD case, then you can probably deduce that you are in for a film that is not going to be exactly normal. Most of what I have seen by co-director Jean-Pierre Jeunet I have enjoyed, but this film I found less than appealing. The story takes place in a steam punk-esque atmosphere that is never completely disclosed where or when it is. Every character in the film is somewhat grotesque and quirky. Daniel Emilfork plays a weirdo named Krank who runs a compound with a series of other freakish creations in the middle of the ocean. Krank, among the others he lives with which include six men that look the same, a dwarfish woman and a brain inside a fishtank called Uncle Irvin, were apparently all created by a currently absent mad scientist. Unfortunately, all of his creations had some deformity including Krank’s inability to dream. To experience dreams, he steals children and tries to tap inside their minds with an odd looking machine. One (Ron Perlman) is a circus strong man who travels with his little brother and some other guy. When his little brother is stolen from their circus caravan by a blind cult, One goes after them. Along the way he befriends a group of child pickpockets including the strong-minded little Miette (Juliet Vittet). In their search for his little brother they encounter more odd characters and circumstances until they finally find the compound where Krank and gang are residing. Now, after reading that synopsis, does any of it make much sense to you? Probably not. That is my problem with this film. Stylistically, it is top notch; the cinematography, direction and production design all add up to create a lusciously weird atmosphere. However, the story itself is so contrived and bizarre that the novelty of the style quickly fizzles out. The one shining piece about the film outside of its beautiful design is Juliet Vittet as Miette. She did a wonderful job in the role and I’m surprised we haven’t seen her in more productions in the years since. This phenomena seems to be fairly standard for child actors though; for instance, whatever happened to the boy who played young Toto in Cinema Paradiso? He was amazing in that. In conclusion, if you like dazzling production design and enough odd characters to put Tod Browning’s Freaks to shame, then you may love this movie. For me, however, I thought it lacked too much in the most important areas of film production: story and character. Since Doctor Who has been on hiatus for the summer after their mid season break, we’ve been watching the spin-off series Torchwood to bridge the gap. 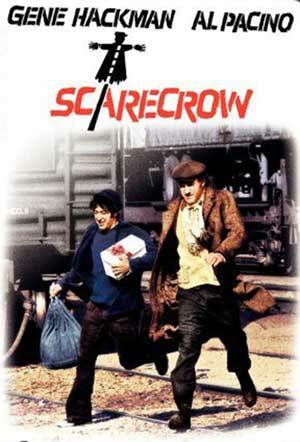 With the new job, it’s a bit difficult to watch features in addition to a series, so I’m going to pull a little known film that I am very fond of from the back log to review: Scarecrow. It’s been a few years since I’ve seen this film, so I’m not sure how hard the film is to find these days. However, about 10 years ago when I first viewed this movie, it was almost impossible to locate. In one of my cinema history books I saw a picture from the film with a young Al Pacino and Gene Hackman. Being a huge fan of both of these incredible actors, I was immediately interested in finding a copy of this film. This was before Netflix, so I had to make the rounds to all the local video stores; none of the stores had the film. Months went on with no success until I came to a Movie Gallery a few towns away. This was around the time that VHS was being fully phased out to DVDs, so they were having a huge sale on VHS movies. The store literally had hundreds of movies for sale for about $3 a piece. I bought properly 500 movies that summer that were hard to find, rare or foreign, of course all VHS, but still it was some way to view these films at the time. Deep within the droves of cassette stacks, I found a lone copy of Scarecrow. I still have it in my collection today and feel it is one of the most underrated films of the 1970s. Directed by Jerry Schatzberg, Hackman plays an ex-convict named Max Milian and Al Pacino plays Francis Lionel “Lion” Delbuchi, an ex-sailor. They meet on a path in California near the beginning of the film and form a partnership as friends, with plans to go into business together when they get to Pittsburgh. Hackman’s character has a plan to open a car wash which he is sure will be a success. Francis agrees to be his partner in business, but first wants to stop by Detroit and make well with his wife, Annie, and the child he left behind and never saw. Essentially, the film is a road movie between these two opposite personalities and their weird friendship that develops in their travels from California to Pittsburgh. Max is quick tempered and aggressive in many situations; whereas, Francis is calm, conservative and child-like. Along the way, they visit several different places, get put in a work camp for awhile and go through both personal injury and triumph. What really works with this film is the true-to-life dichotomy between the characters of Max and Francis’s relationship. They are complete opposites, but in some strange way need each other to survive. They learn from the other and find the only support they have ever known in life in their friendship. The story is shot in a gritty, realist nature which only adds to the believability of the characters and their complex relationship. Needless to say, Pacino and Hackman are absolutely brilliant in this film. It was at the height of both of their professional abilities and the casting choices for their respective roles couldn’t have been better. The film won the Grand Prix at the Cannes Film Festival in 1973 and has been generally well-regarded by critics since it came out. In looking on Netflix, it seems this film is still hard to locate all these years later. However, if you can find a copy, you’ll be pleasantly surprised with this 1970s gem. I had high expectations for this film going into it; perhaps, too high. This is the Coen Brothers take on the Charles Portis novel of the same name. As much as it tries to be a quality adaptation of the novel along with keeping the Coen’s quirky edge, it somewhere misses the mark in being a truly great film. It’s not a bad film, and like I said, perhaps my expectations were too high due to all the hype at the end of last year, but this film didn’t strike me as a 10 best of the year by any means. If that’s the case, 2010 was a worse year for filmmaking than I originally thought. As mentioned above, the film is based on the Charles Portis novel; it is the second adaptation of the book to film, the first being Henry Hathaway’s 1969 version with John Wayne. When an outlaw known as Tom Chaney (Josh Brolin) murders young Mattie Ross’s (Hailee Steinfeld) father over a petty gambling altercation, the young girl seeks justice. 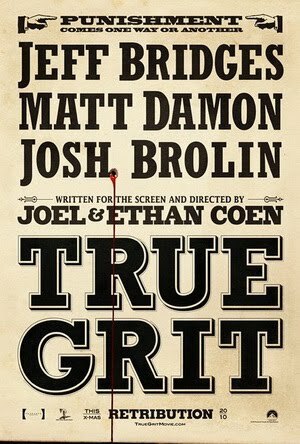 A quick witted and intelligent lad, Mattie seeks out a man with “true grit” to help track down Chaney and the outlaw gang he has made acquaintance with in the Indian Territory. She finds her man in dirty, drunk U.S. Marshall Rooster Cogburn (Jeff Bridges). He reluctantly agrees to help her; they are further aided by a Texas Ranger who has a bounty to claim himself for Chaney, LaBoef (Matt Damon). They set out for their man and, eventually, track him down after several various altercations. The acting in the film was very good. Jeff Bridges delivered, as usual, and the girl, Hailee Steinfeld, who played Mattie Ross was incredible in her debut role. Apparently, the Coen’s auditioned 15,000 girls for the part before deciding on Steinfeld. The source material seems interesting as well; it’s bare bones and fairly straight forward in plot, but seems like a good premise for a western. However, somewhere along the lines, this film just lost steam for me. Primarily, I think, during the final showdown, which I thought should have a level or bravura to it to make it epic. In reality, it seemed rushed and quickly lead into the denouncement. All in all, I didn’t dislike the film. It was a movie I could watch and say, “Well, that was good.” When many critics put this on their best of lists and a lot of my contemporaries recommended the movie, however, to the point of my expectations growing very high – this movie just doesn’t add up completely. Copyright 2001 El Deseo S.A.
Pan’s Labyrinth was one of my favorite films of the year when it came out in 2006 and, since then, I have also enjoyed both installments of the Hellboy franchise. These films, along with the one in review, were all directed by Mexican director Guillermo del Toro. I put this film in my queue on Netflix a while back because it was a del Toro film, but at that time, didn’t realize that this film is supposedly considered the “brother” film to his later release Pan’s Labyrinth. The two films do share many similarities. The story centers around a young protagonist during a time of civil unrest, both contain elements of fantasy/horror and both have cinematography that uses a rich contrasting color palette of deep blues and blazing oranges. A young boy dies at the beginning of the film and is drowned in a reservoir in the kitchen basement of an orphanage, though we don’t see how he died. After the head credits, another boy, Carlos (Fernando Tielve), is brought to the orphanage by several rebels who are currently fighting in the Spanish Civil War because his father died in the war. Being a new kid, Carlos is picked on and has to prove himself amongst the other children. However, the ghost of the young boy who died at the beginning, also makes appearances to him and tries to warn him of impending danger to all at the orphanage. 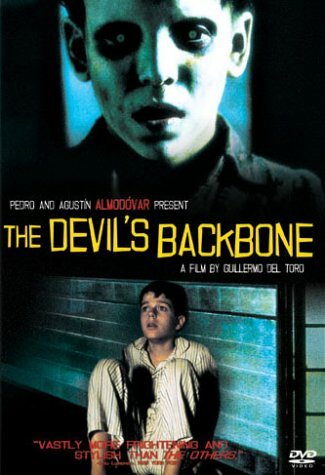 Without giving too much away, the remainder of the film unravels what happened to the young ghost boy and what dangers Carlos and the others must avert to stay alive. This film, like Pan’s Labyrinth, has an epic feel to it, though it is not overtly long. It is visually stunning and has a very high production value. Also, del Toro seems to be very adept at handling child actors, as the majority adolescent cast in this film are all superb, as was the young girl in Pan’s Labyrinth. In addition, since he came from a visual effects background, the visual effects in the film are also very well done. More importantly, however, is that the story itself is very intriguing and the high production values just help further illicit the beauty and horror of the story itself. If you really enjoyed Pan’s Labyrinth, then I highly reccomend this film. If you haven’t seen either of these films, then I highly suggest that you try one or the other to see if it is a style fitting you. Unfortunately, del Toro hasn’t directed a film since 2008’s Hellboy II: The Golden Army. After seeing another effort like this from him, I hope he won’t stay away from behind the camera much longer, though we do have Peter Jackon’s The Hobbit that was co-penned by del Toro to look forward to soon. * I saw three films over the weekend, so as not to get backlogged, I am going to post two of my reviews today. Also, I wanted to take a moment to address my review factors as I’m sure some of you might be wondering why I don’t have any one and two star reviews as of yet. I try to avoid films that I think could or will be disasters. With as many movies as I have seen and the many more that I want to see, I find that there is no reason to waste time on watching what I consider a bad film. Of course, every so often, I do run into one and there will be a bad review for it. However, for the most part, I try to avoid such films at all costs. Anyway, let’s get on with the actual review for this film. My girlfriend is going to kill me for what I rate this movie, as we had very differing opinions. To be fair, however, I will say that this is definitely the type of movie that you have to be in the mood for to enjoy. Not every day is a day for a strict drama set in the 1500s, just as not every day is right for a romantic comedy or intense thriller, etc. 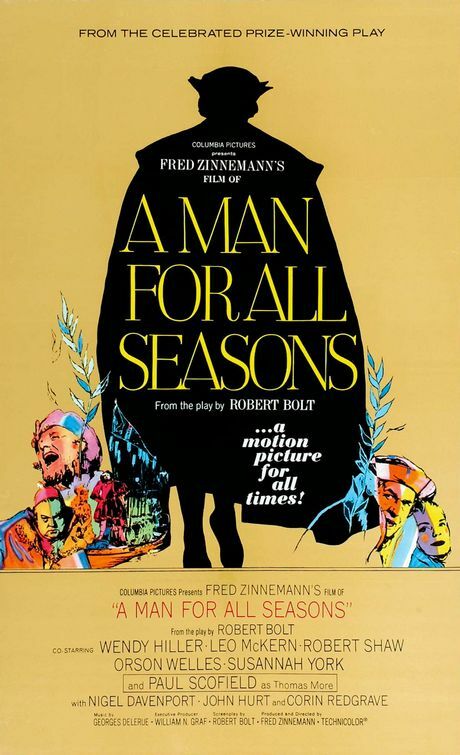 A Man for All Seasons swept the 1966 Academy Awards. 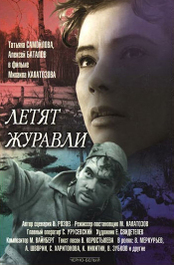 In addition to its Best Picture win, it won awards for Best Director, Best Actor in a Leading Role for Paul Scofield, Best Cinematography (Color), Best Costume Design (Color) and Best Adapted Screenplay, among receiving nominations for Best Supporting Actor for Robert Shaw and Best Supporting Actress for Wendy Hiller. The film was directed by Fred Zinnemann (High Noon, From Here to Eternity, Day of the Jackal, Sophie’s Choice) and was adapted from his stage play of the same name by Robert Bolt. The story revolves around Sir Thomas More, played by Scofield, who stands up to King Henry VIII (Shaw) on moral grounds regarding the king’s decision to renounce the Royal Catholic Church. Henry VIII was originally married to Catherine of Aragon; however, she was barren and unable to have children. So, the King began an affair with Anne Boleyn. Yet, at this time it was unlawful to get a divorce in the eyes of the Roman Catholic Church. Despite many efforts to lobby against the church, the king finally decides to renounce the church and start the Church of England, so as to be granted his divorce from Catherine of Aragon. In doing so, he makes it parliamentary law to take an oath recognizing his decisions that he is head of the Church of England and that his marriage to Catherine was annulled. More, a lawyer, is a man of devout judicial and religious beliefs. In his heart he cannot accept that what the king has done to be right. For this betrayal of state, he is locked away in prison and eventually beheaded. This is a story of a man standing up for what he beliefs to be right, no matter the consequence. The epic stature of the film with England during the 1500s as a backdrop, creates an interesting contrast to the deeply personal story of More. Everything about this film works. The story is excellent, the direction is perfect, the cinematography is beautiful and, first and foremost, the acting is exemplary. Scofield, as More, is amazing. Every scene he is in, he is able to command a presence; it is a very deserving win for Best Actor. The supporting cast which includes Wendy Hiller, Orson Welles, Robert Shaw and a very young John Hurt, are also a joy to watch. Like I said, this is a movie you have to be in the mood for. If, however, you feel like an amazingly moving story of one man’s beliefs and convictions against the heads of state set against an epic, sprawling backdrop – then they don’t get much better than this. I went to the movie theatre over the weekend for the first time in a couple of months (outside of the 5th Quarter premiere a few weeks ago, but I didn’t pay for a ticket for that). 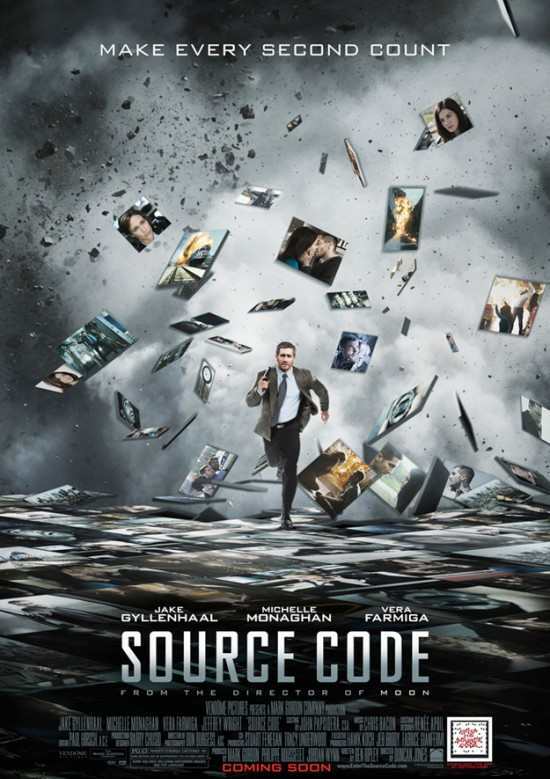 My girlfriend, Maddie, had mentioned wanting to go see this movie Source Code. Being that this time of year is usually when all the worst movies come out and that 2011 has been off to a riveting start (note sarcasm) with movie selection, I wasn’t too interested in spending money on the venture. However, I looked into the reviews online and imdb.com, and it looked like this might be a good film to see. In the end, I’m happy I went. This is the second film from director Duncan Jones; his first was 2009’s Moon. The film starts with Captain Colter Stevens (Jake Gyllenhaal) waking up on a train. He is disoriented and doesn’t seem to know where or who the woman (Michelle Monaghan) across from is. He moves through a series of events and interactions on the train trying to figure out what is going on and why all this strange phenomena is happening to him. After 8 minutes, the train explodes and he warps into a capsule. In the capsule, he is being monitored and spoken to by a Captain Goodwin (Vera Farmiga). Stevens learns that he is part of a top secret experiment involving “time reassignment,” in which he is working towards finding the culprit who planted the bomb on the train. Without giving too much away, the film gets more and more complexing as it moves forward and takes advantage of its interesting play on “time travel” and parallel universes. Gyllenhaal, Monaghan and Farmiga, all perform quite well and convincingly in their roles. Jeffrey Wright also plays an intricate role as the head of the Source Code Program. The story is a fine mixture of action in the train sequences and dialogue heavy character building in the capsule scenes between Stevens and Goodwin. The science behind some of the events in the film definitely warrants suspension of disbelief. This is, however, good science fiction through and through. The pacing, direction and interesting story all come together to make a really entertaining movie and, in the end, what more can you ask for? Not all films have to be amazing works of art to be truly good films; this film is definitely one of those. Would I call it a masterpiece? No. A work of art? No. A very entertaining, well made motion picture? Yes.